While it’s not something you want to build your offense around, there’s no denying that having players that have the ability to score one on one is a great boost to your offense. You won’t always be able to score in transition, and sometimes your offense will break down and this is when that one-on-one scoring ability will show its value. 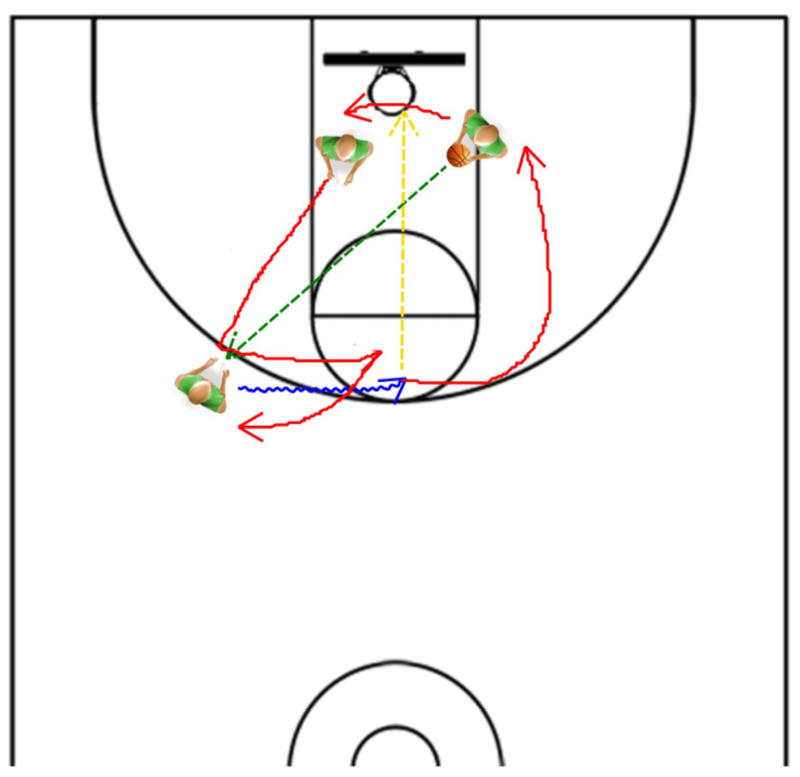 And while individual improvement drills will help improve your players abilities, you still need to give them a chance to practice these new skills in a live 1 v. 1 situation. That’s why I definitely encourage coaches to get their kids playing one-on-one in practice – but with this drill that has a slight twist to incorporate a 3rd player. Have a player line up on each block, facing halfcourt, with a third player standing on the wing facing his teammates. The player that is on the block farthest from the player on the wing will be the only player holding a ball to start off. That player will then make a pass across the key to the player on the wing, and when this happens, the man lined up on the close block will sprint and close out to the ball. These two will now play live, while the passer slides over to the other block. The offensive player is allowed two dribbles to score, to encourage efficiency, and to keep the drill moving fast. After shooting, he will get his own rebound and head to the far block, ready to make the pass out to the wing. The defensive player will switch to offense after every possession. As always, you should encourage competition – whether that is first player to a set number of points, or maybe even seeing who can score the most points in 2 minutes. Penalize players a point for fouls – this will keep them from fouling to prevent points, and also teach them how to play tough, hard-nosed defense without reaching or blocking their opponent. Remember to stop the drill and change the order of the players every so often so that your players can learn to defend and score in different matchups. Make it a tournament! Your players will lavish at the thought of proving they are the best 1 on 1 player on the team, and it is definitely valuable information for you as a coach as well! 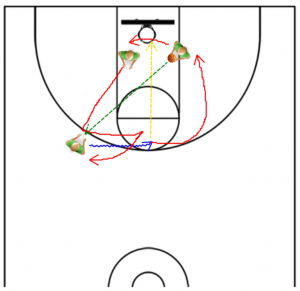 If you’ve got a ton of great 1 on 1 players but you’re looking for more structure on the offensive end, check out this great new video on the 3-2 Motion!